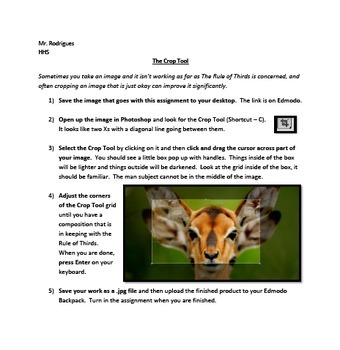 The zip file contains a .docx file with the directions for playing with The Rule of Thirds or Crop Tool in Photoshop. I've also included the photograph that was used in the example. It would be appropriate to go over the Compositional Guidelines PowerPoint presentation before going through this assignment.